Each month the non-commissioned officers are obliged to provide the soldiers in the army with written counseling statement. With the help of scheduled counseling officers can help the soldiers to correct certain shortcomings and exclude any problems in the army. The best way to record a counseling is to use the form DA-4856 which is intended for Developmental Counseling. This document is also used by leaders in order to help their subordinates to develop and provide them with some career related advices. Using DA-4856 leaders can easily provide feedback to the people they supervise. On our site you will find a fillable da-4856 sample that can be easily filled out and submitted online. If required, you may print a form and further prepare it by hand. In order to customize a document according to your requirements, use an editable form template. Try all editing tools and prepare the needed document just in a few minutes. How to fill out DA-4856? DA-4856 consists of four parts which are placed on two pages. Part 1 captures an administrative data of a soldier who is going to be counseled and counselor`s name. Here provide details about soldier`s name (including first, last and middle name) and rank. It is also important to specify the date on which the counseling is conducted and name of soldier`s organization. Part 2 of the form is filled out by the leader. Here he is required to specify the purpose for the counseling (for instance professional, performance or event oriented counseling). The leader`s observations and facts regarding the counseling are also to be provided. 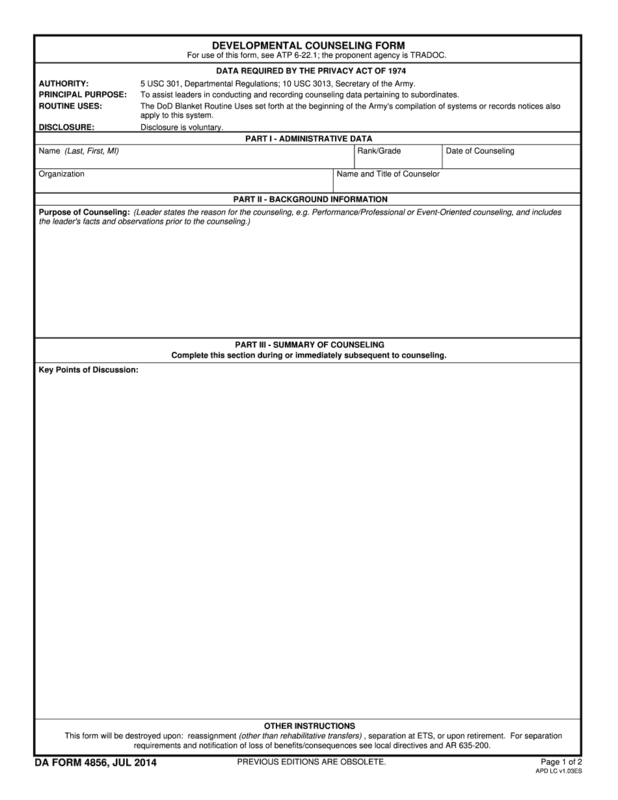 Part 3 of the blank form is related to summary of counseling. It is usually filled out immediately prior to or during the counseling by both the leader and the subordinate providing all necessary examples and observations. In section “Plan of action” the leader describes the subordinate`s actions which are to be carried out in order to reach agreed goal. The next section is session closing. Here the leader summarizes key points of a session and checks to which extent a subordinate understands the plan of actions. Part 4 represents assessment of the plan of action and evaluates if the plan of action is effective to reach a required result. It is filled in by both the counselor and individual. In order a DA-4856 to be legally binding, it has to be signed by both parties. After a document is complete, check it for mistakes and sufficiency of information.